I was so excited when I opened my new Country Living magazine (September issue) on Thursday and found that my hometown of Rathdrum, ID was featured on page 52. The Vintage Barn Antiques show is a twice-yearly event held in Rathdrum by Rolane Hopper. I lived and went to school in Rathdrum (go Hawks!). Anyway, I'm sure you can see why I would be excited to see my little hometown in one of my favorite magazines. It's a beautiful place and is also home to Juanita Carmack - The Salsa Chick who has also been in Country Living as a featured entrepreneur. Yay Rathdrum, and yay Vintage Barn Antiques! My mom goes to their shows and tells me how great they are - I'm so envious! In other exciting news, Evy and I made a berry pie together using The Farm Chick's recipe for both the pie and the crust. I highly recommend it if you don't have a favorite crust recipe already. The recipe is for strawberry rhubarb, but we couldn't find rhubarb anywhere - not frozen, not fresh. Instead I decide to do a strawberry blueberry pie using the exact same recipe. It was wonderful! I also really love strawberry rhubarb so as soon as I can get my hands on some rhubarb I will try that one as well. If you want to do the berry pie that I did, just do equal parts of each fruit. Check out some of the recipes at The Farm Chicks. I've made their blackberry crisp recipe and it's very good and so easy. You can us what ever fruit you like if you're not a blackberry fan. 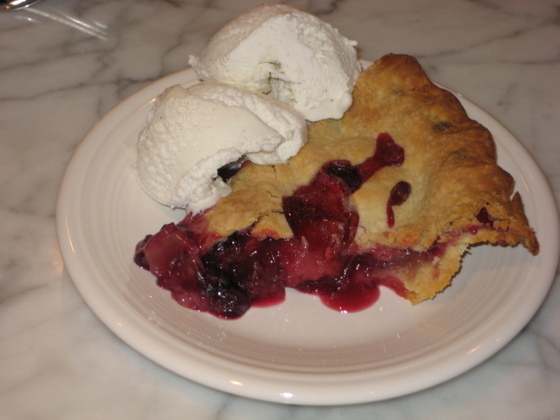 I've used peaches and blackberries - both are excellent with vanilla ice cream. The apron is one I got at The Farm Chicks - not made by them, but one of the vendors who was at the show - I don't remember who made it and there is no label on it. I'd love to be able to pass along the name of the person who created it. Evy's apron was made by my very talented mom. It's a vintage pattern. I have one as well that she made for me. I was trying to do little cut outs on the top of my pie, but I didn't have a cutter that was small enough. I was trying to do something that looked like the crust that The Farm Chicks did for their strawberry rhubarb pie. Does anyone know where I can find some little cut outs like the one used below? 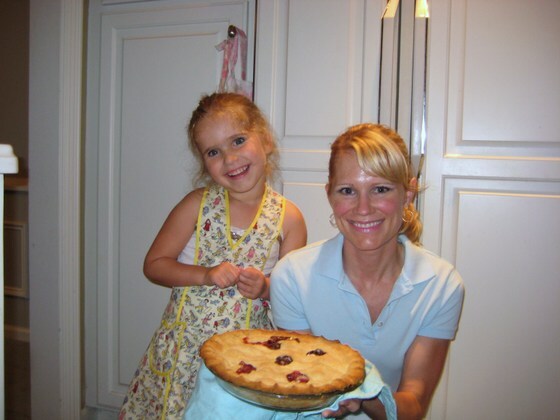 Their pie recipe was also featured in Country Living magazine. Heat the oven to 375°F. Roll out one disk of dough on a lightly floured surface to 1/8-inch thickness, and transfer to a 9-inch pie pan. Set aside and keep chilled. Roll the remaining dough to 1/8-inch thickness and cut slits or use a miniature star cutter to create vents. Combine the rhubarb, strawberries, sugar, and flour in a large bowl, and transfer to the prepared pie pan; drape the rolled-out dough over the pie. Trim the edges of both crusts, leaving a 1/2-inch overhang. Fold the dough under, lightly pinching to seal the top and bottom crusts. Crimp around the rim and chill for 10 minutes. Bake on the center shelf of the oven until golden brown — 45 to 55 minutes. Cool on wire rack. Combine the flour, salt, and sugar in a large bowl. Cut in the butter using a pastry blender or your fingers until the mixture resembles coarse meal. Whisk the vinegar, egg, and 1/2 cup of ice water together and mix into the flour mixture with your hands until just combined. Transfer to a clean work surface, and gently press to form a dough. Divide the dough into 4 equal parts. Shape each into a ball, flatten slightly to form a disk, and wrap in plastic. Chill for at least 1 hour. On deck for my next post will be pictures of the wonderful crown and witch's hat that I purchased from the very talented Rosemary.